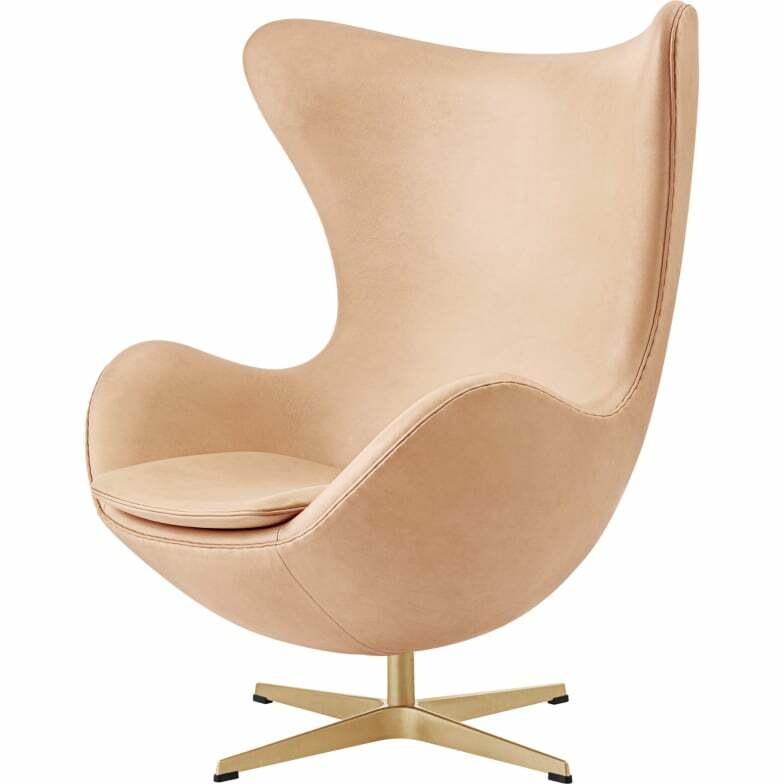 The Arne Jacobseln armchair classic "The Egg™" in limited number of 1958 pieces! This 60-year jubilee is a bow to the silhouette of The Egg™, Swan™ and Drop™ chairs as well as to the SAS Royal Hotel - the design hotel for which they were once created. Discover traces of exquisite beauty such as scars, small insect bites and visible neck wrinkles - all reflecting the natural life of the remains of the leather hides. Note that the colour will darken and change over time to a certain vintage look due to exposure to sunlight and use. The classic aluminium surface is gold-plated (23 K) and the result is an almost silky sheen that further enhances the exclusive look of this limited edition. The Egg™ is available in a limited number of 1958 pieces. Each Egg™ is distinguished by a special numbered leather engraving for the 60th anniversary. Exclusive Danish furniture design. The label Fritz Hansen stands for certificated craftsmanship, uncompromising quality and some of the great classic design furniture such as Arne Jacobsen Ant chairs the Series 7, armchairs like The Swan and The Egg, to name just a few. Also the Danish designer Hans J. Wegner and the German creative duo Jehs + Laub have designed furniture for Fritz Hansen. Do you have a question about "The Egg™ 60th anniversary edition"? How can we contact you?